Download "Business Analytics Evaluation Guide. 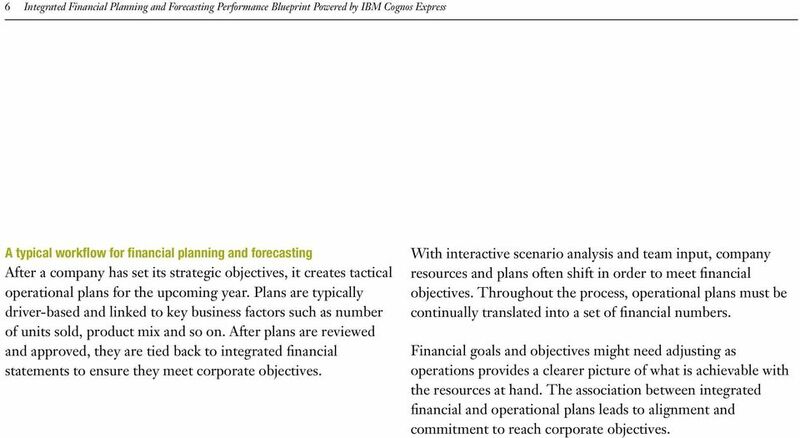 Integrated Financial Planning and Forecasting Performance Blueprint Powered by IBM Cognos Express"
2 2 Integrated Financial Planning and Forecasting Performance Blueprint Powered by IBM Cognos Express Introduction A financial plan helps companies establish guidelines for developing operational and financial plans. Key corporate objectives are rationalized and capital investments are considered. Objectives are translated into tangible financial targets. Investment decisions and targets lead to the creation of integrated financial statements that link financial goals to financial metrics. Based on these, organizations can then focus on specific objectives and targets. The key financial planning and forecasting outputs are a consensus income statement, balance sheet, cash flow and resulting financial metrics. Most companies rely on ERP systems and spreadsheets for financial planning, which can often create errors and make it difficult to arrive at consensus plans and budgets. Financial ERP systems can handle individual transactions very well and spreadsheets offer flexibility with great individual modeling capabilities; however, neither can really provide centralized views of the data and information because of their limited focus. To boost accuracy in forecasting and improve resource allocation, a solution with flexible modeling capabilities, personalized analytics and integrated workflows is required. 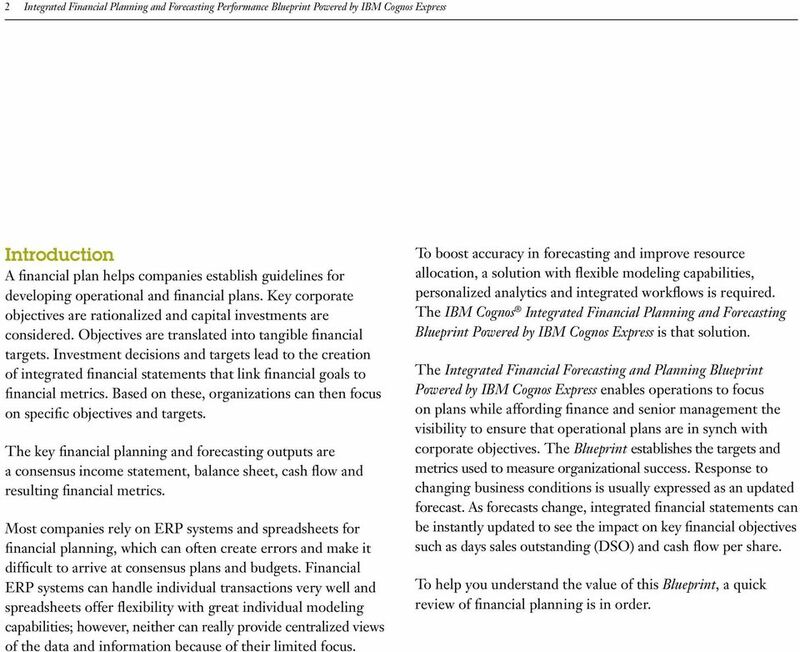 The IBM Cognos Integrated Financial Planning and Forecasting Blueprint Powered by IBM Cognos Express is that solution. 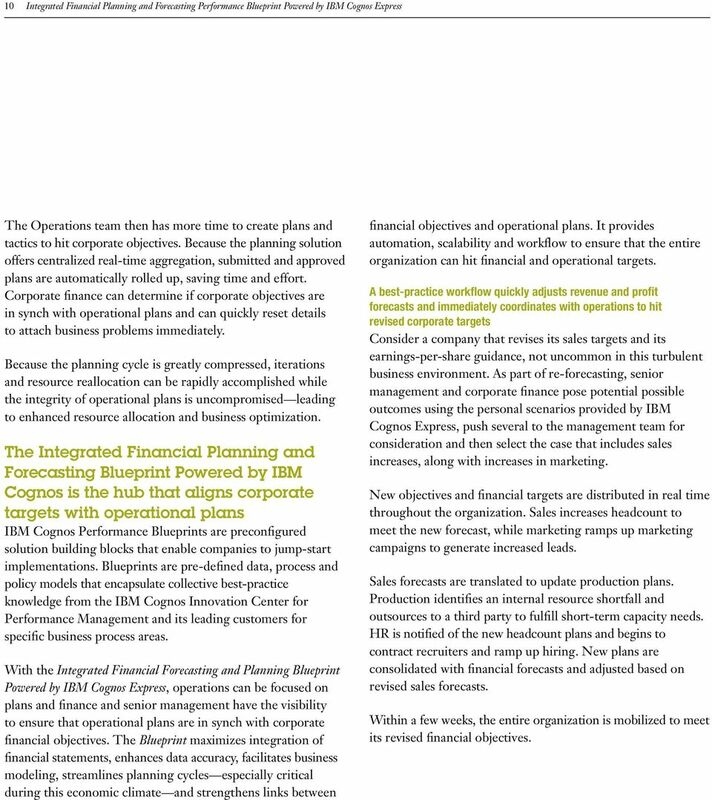 The Integrated Financial Forecasting and Planning Blueprint Powered by IBM Cognos Express enables operations to focus on plans while affording finance and senior management the visibility to ensure that operational plans are in synch with corporate objectives. The Blueprint establishes the targets and metrics used to measure organizational success. Response to changing business conditions is usually expressed as an updated forecast. As forecasts change, integrated financial statements can be instantly updated to see the impact on key financial objectives such as days sales outstanding (DSO) and cash flow per share. To help you understand the value of this Blueprint, a quick review of financial planning is in order. 3 Business Analytics 3 Financial planning In the financial planning process, the focus is on creating integrated financial statements and linking them to operational plans. For example, a company that offers certain customers more liberal payment terms to increase sales forecast revenue must also evaluate the effects on cash flow. 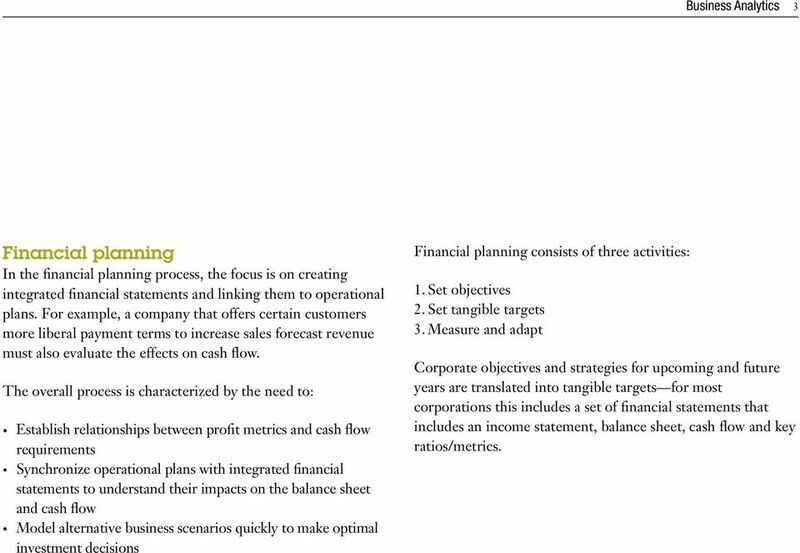 The overall process is characterized by the need to: Establish relationships between profit metrics and cash flow requirements Synchronize operational plans with integrated financial statements to understand their impacts on the balance sheet and cash flow Model alternative business scenarios quickly to make optimal investment decisions Financial planning consists of three activities: 1. Set objectives 2. Set tangible targets 3. Measure and adapt Corporate objectives and strategies for upcoming and future years are translated into tangible targets for most corporations this includes a set of financial statements that includes an income statement, balance sheet, cash flow and key ratios/metrics. 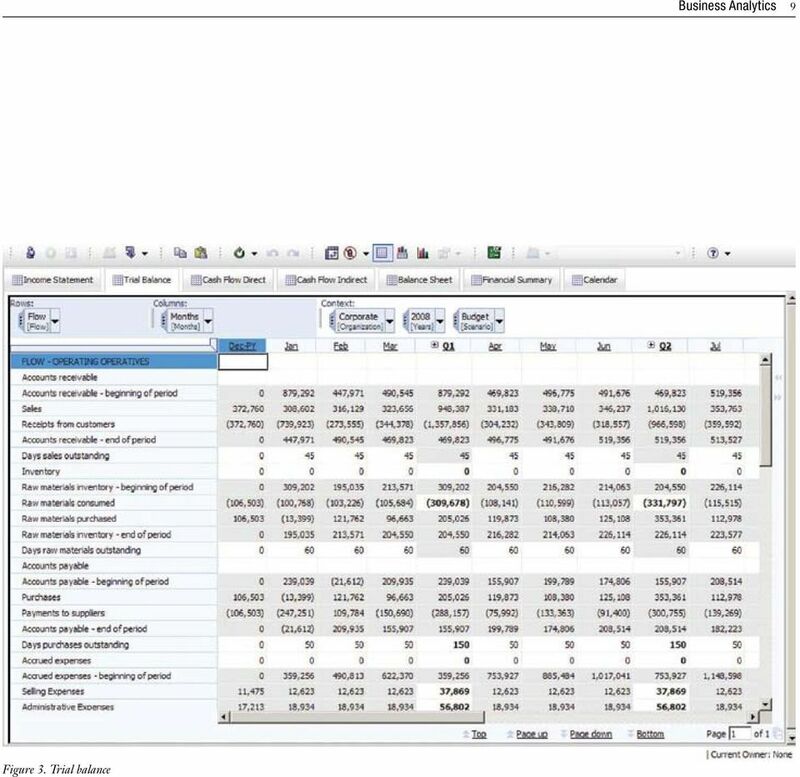 5 Business Analytics 5 The statements should be integrated, so that any change in underlying assumptions ripples through all of them: days sales outstanding assumptions affect the balance sheet along with cash position; revenue plan assumptions affect balance sheet and cash flow and so on. Because such targets are frequently iterated, accuracy is increased. In high-performance companies, financial statements are the baseline for measuring results and are dynamic documents in constant use, not mere reports collecting dust on a shelf. The process begins with setting financial objectives expressed as financial targets or goals to establish operational plans, budgets and forecasts. Objectives are discussed and finalized, then expressed as a set of tangible targets in the form of financial statements initially an income statement. Revenue targets are modeled based on agreed-upon financial objectives, then measured against profitability objectives to identify margin requirements. At this point, resources can be properly allocated throughout the company. 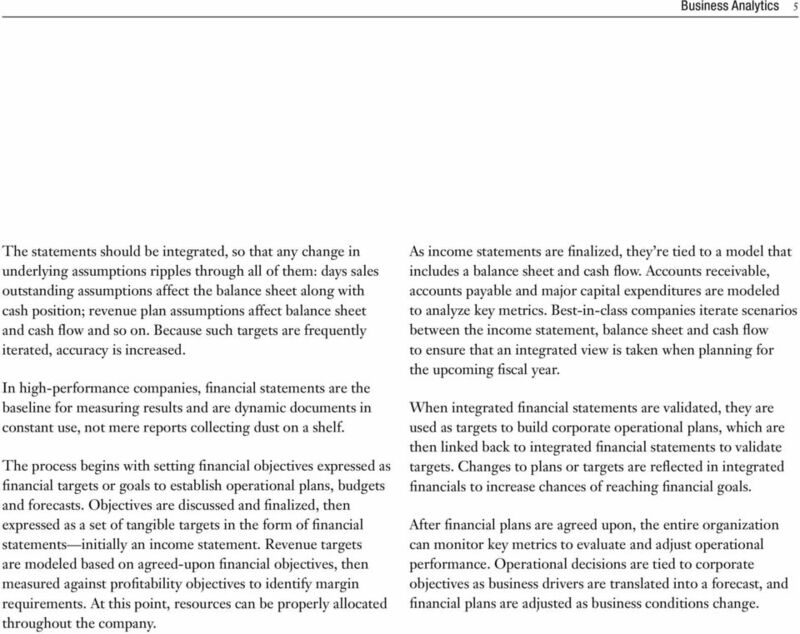 As income statements are finalized, they re tied to a model that includes a balance sheet and cash flow. Accounts receivable, accounts payable and major capital expenditures are modeled to analyze key metrics. Best-in-class companies iterate scenarios between the income statement, balance sheet and cash flow to ensure that an integrated view is taken when planning for the upcoming fiscal year. When integrated financial statements are validated, they are used as targets to build corporate operational plans, which are then linked back to integrated financial statements to validate targets. Changes to plans or targets are reflected in integrated financials to increase chances of reaching financial goals. After financial plans are agreed upon, the entire organization can monitor key metrics to evaluate and adjust operational performance. Operational decisions are tied to corporate objectives as business drivers are translated into a forecast, and financial plans are adjusted as business conditions change. 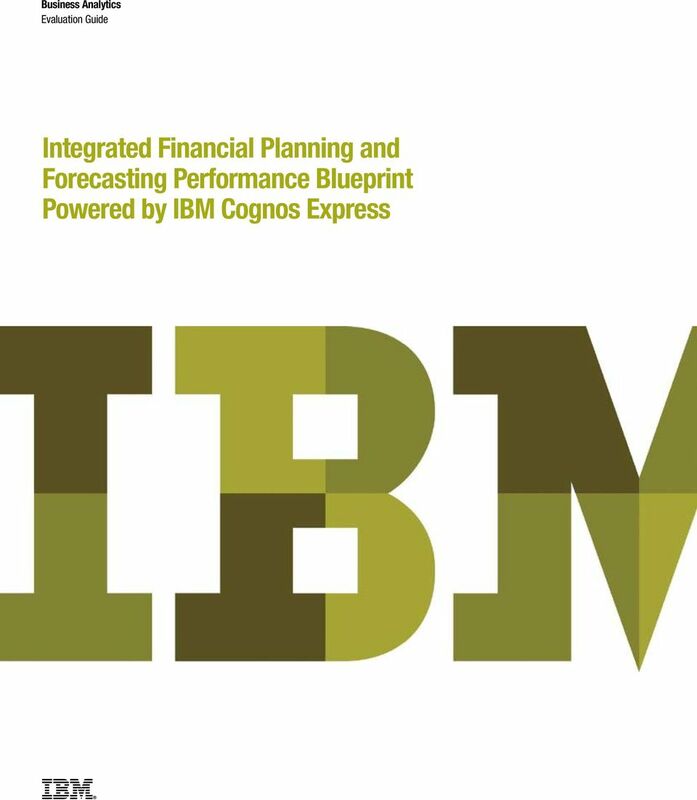 6 6 Integrated Financial Planning and Forecasting Performance Blueprint Powered by IBM Cognos Express A typical workflow for financial planning and forecasting After a company has set its strategic objectives, it creates tactical operational plans for the upcoming year. Plans are typically driver-based and linked to key business factors such as number of units sold, product mix and so on. After plans are reviewed and approved, they are tied back to integrated financial statements to ensure they meet corporate objectives. With interactive scenario analysis and team input, company resources and plans often shift in order to meet financial objectives. Throughout the process, operational plans must be continually translated into a set of financial numbers. Financial goals and objectives might need adjusting as operations provides a clearer picture of what is achievable with the resources at hand. The association between integrated financial and operational plans leads to alignment and commitment to reach corporate objectives. 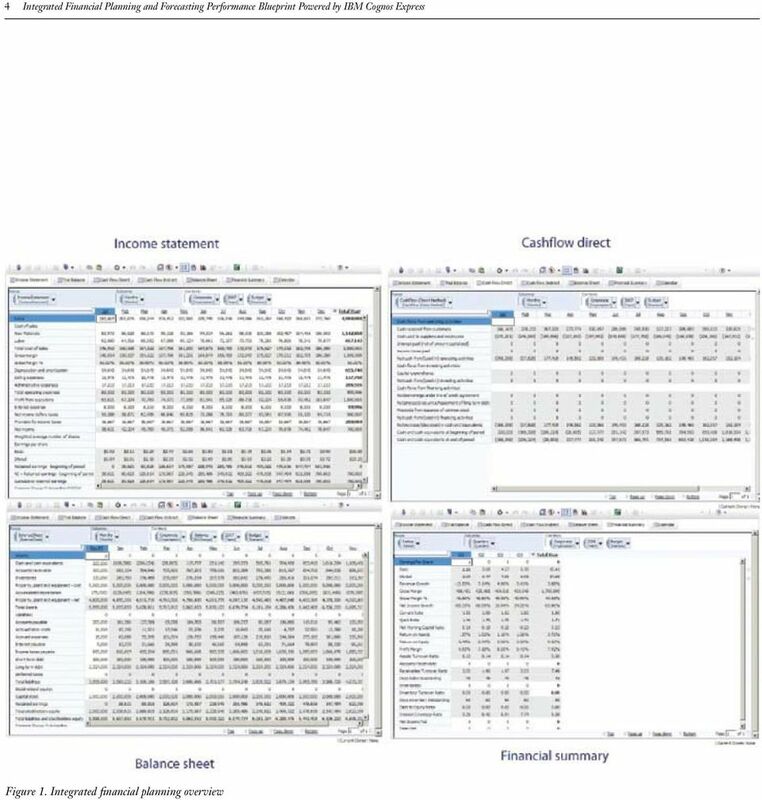 8 8 Integrated Financial Planning and Forecasting Performance Blueprint Powered by IBM Cognos Express ERP systems and spreadsheets in the process Financial ERP systems readily capture individual account transactions, and spreadsheets offer flexibility with great individual modeling capabilities. But neither is well-equipped to manage enterprise-wide integrated financial planning. ERP solutions cannot easily model the business beyond general ledger accounts and therefore do not have the capacity for complex operational plans. Spreadsheets can handle modest complexity, but offer neither centralized management nor aggregation. The process is lengthy, the numbers are inaccurate and a true integrated financial statement is nearly unattainable. In fact, most companies forgo integrated financial statements and spend more time on income statements with balance sheet and cash flow as afterthoughts. Given the time and labor required to model financial objectives, there is little opportunity for the rest of an organization to link operational plans with corporate objectives properly. Finance typically mandates objectives and barely considers operational plans. Opportunities are lost, serious resource issues go unnoted and there is minimal accountability and commitment to corporate objectives. The planning cycle is so time and resource-intensive that plans for the upcoming year are already out of date when operational budgets are finalized and linked to financial plans and objectives. High-performance companies replace the manual spreadsheet process with flexible multidimensional modeling capabilities for complex requirements such as profitability analysis, personalized planning and analytics, and integrated workflows to minimize error and to boost contribution and accountability. Using IBM Cognos Express, the process is integrated and accelerated and enables more flexible modeling and analysis to improve forecast reliability. Changes to accounts payable and accounts receivable can occur in decreasing revenue while unnoted expenditures ripple through integrated financial statements. Modeling what-if scenarios using data spreading the IBM Cognos Express multi-dimensional allocation function to simulate business contingencies is quick and easy. Because financial objectives are easily identified and modeled, financial targets are quickly passed to operations. 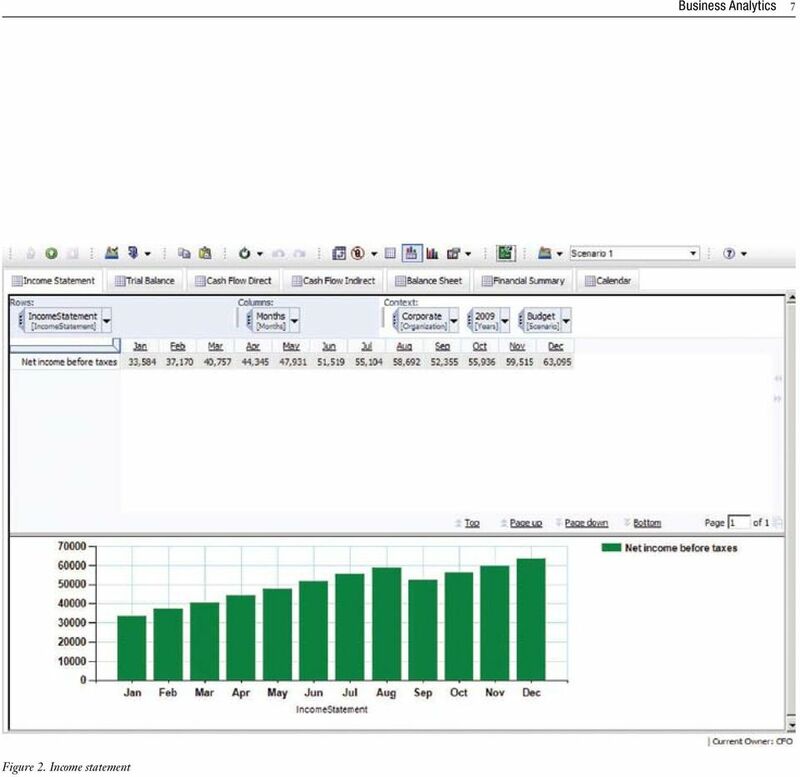 In IBM Cognos Express, a planner assembles the views and deploys the planning model to users and groups with a few keystrokes. With IBM Cognos Express, advanced personalization is blended with workflow activities. During the planning process, each contributor can dynamically build her own alternatives. For example, she might add a new department or product or remove a territory and recalculate the numbers almost instantly. She can then share any number of the scenarios with the team, and submit the best scenarios into the planning templates for optimal business. 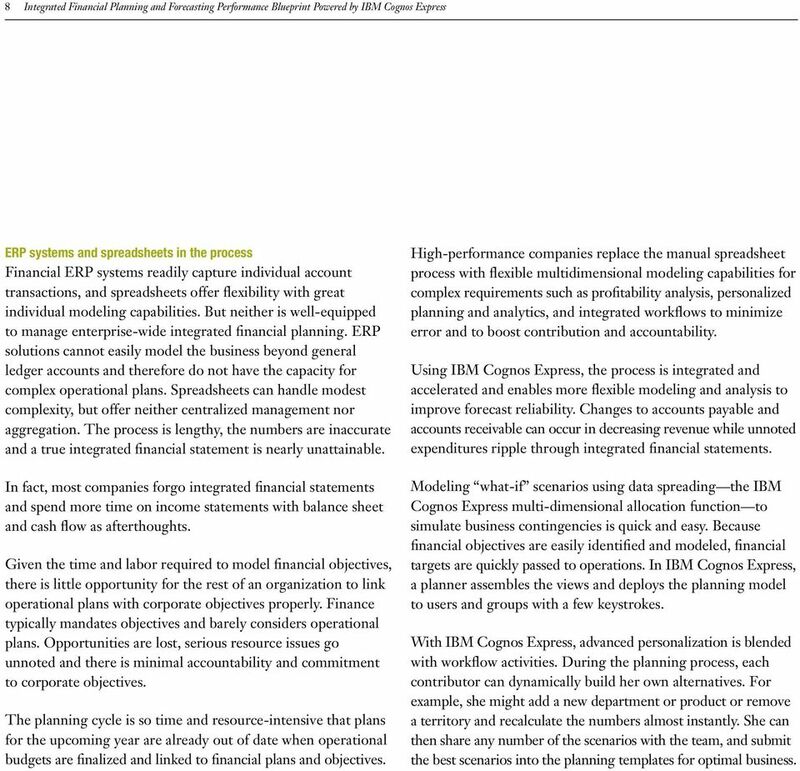 10 10 Integrated Financial Planning and Forecasting Performance Blueprint Powered by IBM Cognos Express The Operations team then has more time to create plans and tactics to hit corporate objectives. Because the planning solution offers centralized real-time aggregation, submitted and approved plans are automatically rolled up, saving time and effort. Corporate finance can determine if corporate objectives are in synch with operational plans and can quickly reset details to attach business problems immediately. Because the planning cycle is greatly compressed, iterations and resource reallocation can be rapidly accomplished while the integrity of operational plans is uncompromised leading to enhanced resource allocation and business optimization. 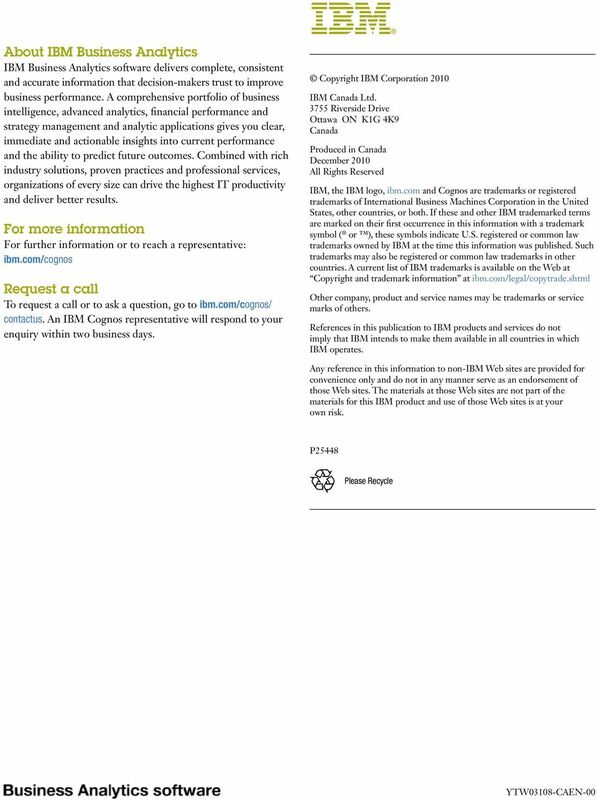 The Integrated Financial Planning and Forecasting Blueprint Powered by IBM Cognos is the hub that aligns corporate targets with operational plans IBM Cognos Performance Blueprints are preconfigured solution building blocks that enable companies to jump-start implementations. Blueprints are pre-defined data, process and policy models that encapsulate collective best-practice knowledge from the IBM Cognos Innovation Center for Performance Management and its leading customers for specific business process areas. With the Integrated Financial Forecasting and Planning Blueprint Powered by IBM Cognos Express, operations can be focused on plans and finance and senior management have the visibility to ensure that operational plans are in synch with corporate financial objectives. The Blueprint maximizes integration of financial statements, enhances data accuracy, facilitates business modeling, streamlines planning cycles especially critical during this economic climate and strengthens links between financial objectives and operational plans. It provides automation, scalability and workflow to ensure that the entire organization can hit financial and operational targets. A best-practice workflow quickly adjusts revenue and profit forecasts and immediately coordinates with operations to hit revised corporate targets Consider a company that revises its sales targets and its earnings-per-share guidance, not uncommon in this turbulent business environment. 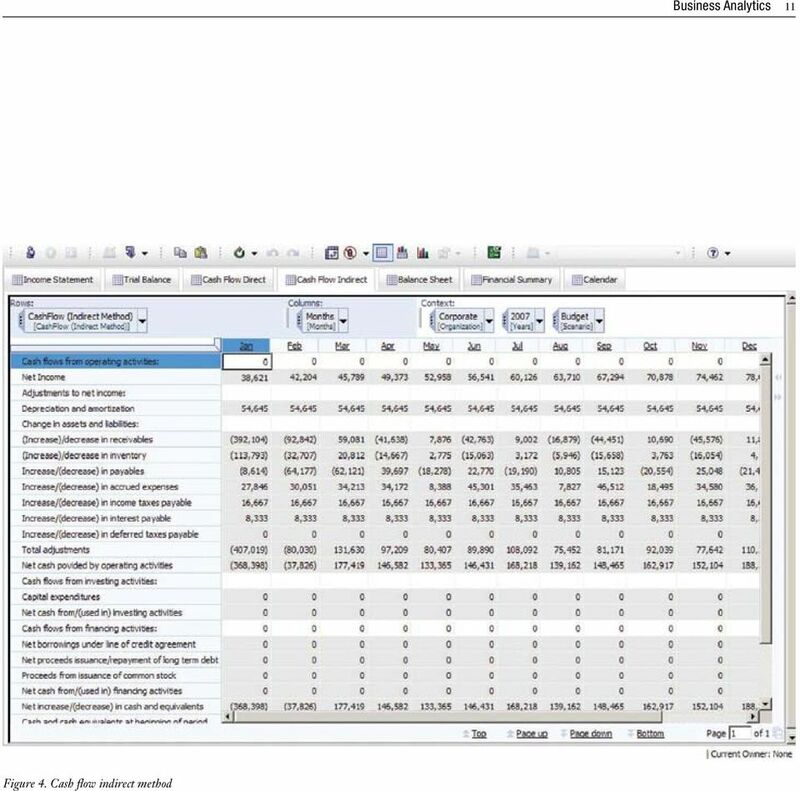 As part of re-forecasting, senior management and corporate finance pose potential possible outcomes using the personal scenarios provided by IBM Cognos Express, push several to the management team for consideration and then select the case that includes sales increases, along with increases in marketing. New objectives and financial targets are distributed in real time throughout the organization. Sales increases headcount to meet the new forecast, while marketing ramps up marketing campaigns to generate increased leads. Sales forecasts are translated to update production plans. Production identifies an internal resource shortfall and outsources to a third party to fulfill short-term capacity needs. HR is notified of the new headcount plans and begins to contract recruiters and ramp up hiring. New plans are consolidated with financial forecasts and adjusted based on revised sales forecasts. Within a few weeks, the entire organization is mobilized to meet its revised financial objectives.